It’s been ages since I last had a relaxing massage so I devoted my entire schedule today to spoil myself for some “me-time” pampering. I was mildly disappointed to find out that the first spa I went to in F. Ramos Street was closed (that’s weird, why would they close on a Sunday, of all days?). I didn’t want to kill the vibe so I opted to just look somewhere else. That was when I discovered EarthLife Wellness Spa located at the second floor of Gran Prix Hotel & Suites right across Robinson’s Place. I decided to go for a 1-hour Aroma Hilot Massage which costs P300.00. As explained by the receptionist, it is a fusion between Hilot and a Swedish massage. For those who have never tried Hilot before, it is a traditional Filipino folk healing technique widely practiced in rural areas (and some in urban communities) commonly done by a manghihilot (hilot practitioner). Since health services from medical doctors in the Philippines can be tad pricey, most Filipinos turn to manghihilot for an affordable healing alternative. Hilot does not only involve a massage. It also offers herbal medication and chiropractic methods to improve the physical and mental well being of the patron. Swedish massage, on the other hand, is the most popular type of massage that uses gentle and slow massage strokes to help release tensions from the body. It is based on the Western concept of human anatomy rather than the energy-focused modality typical among Asian massage techniques. My masseuse asked me to lie face down and worked on my back with long gliding strokes and firm tapping with the help of a fragrant peppermint oil. She then firmly applied pressure on muscle knots on my legs, arms, all the way up to my neck and head. It was soothing to the point that I almost fell asleep and barely heard her when she offered to have an Ear Spa afterwards. I could only mutter a soft “no, thanks”. Then it was back to business until we were through. EarthLife Wellness Spa has all the amenities and services offered by most budget spas that littered around the metropolis but is largely unheard of. And that’s the beauty there. You don’t have to be well-known to be great. I must say the massage was pleasantly exquisite and for the price I paid, the service was more than adequate. In fact, I’m thinking of booking another one in the near future. Probably to get an Ear Spa which sounds like an interesting thing to try. If you have never had a massage before or don’t get one that often, their Aroma Hilot Massage or a regular Swedish massage would be perfect for you. But of course, you should always consult your doctor to ensure that it’s safe to engage in any massage. Aaah you reminded about my long overdue massage. I can’t even remember when was the last time I had one! Yeah, you should find time to pamper yourself, Anne. You won’t regret it. Oh yes, it is especially if you’re new to the whole spa scene. Relaxing but not that overpowering. I like that they combined Swedish massage and our own traditional hilot. But what on earth is an ear spa? Hahaha. I will try this place out the next time I decide to get a massage! Ear spa or ear candling is basically safe way to clean your ears using cone-shaped candles. Normally, we use the ordinary cotton buds to clean our ears which doesn’t help in cleaning since it pushes the ear wax deeper into the ear canal. Ear candling can prevent that from happening and still clean your ears inside. Good for you. I think we should pamper ourselves from time to time to help us cope with stress at work and home. Massage has all the health benefits to relieve us temporarily from stress-induced health conditions. Massage is also one of my fave stress relieve activities- it soothes ny body, it relaxes my soul. I wonder what was that ear spa you mentioned above, I need to know if it’s ear candling. 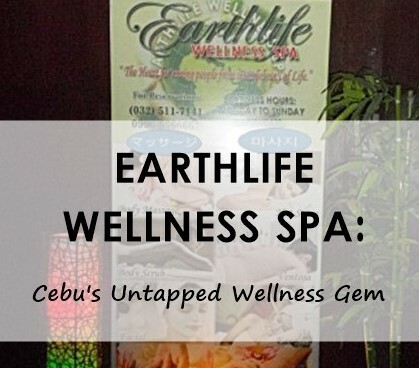 Anyhow, I’ll use your blog as my guide for spas and wellness here in Cebu. Thanks for this post, Jaz. True that! With regards to the ear spa, it’s actually ear candling. It helps you to clean your ears safely without having to use cotton buds which might actually aggravate the production of more ear wax more rather remove it. Yes, they have naman. Just ask their receptionist. thanks for sharing this! i badly need a massage now! and i dont like going on very “mainstream” ones. Yeah, you should get a massage. You deserve it. Not many spas offer ear spa so I might want to try it maybe on my next visit.